Effective crisis management has long relied on both the formal and informal response communities. Social media platforms such as Twitter increase the participation of the informal response community in crisis response. Yet, challenges remain in realizing the formal and informal response communities as a cooperative work system. We demonstrate a supportive technology that recognizes the existing capabilities of the informal response community to identify needs (seeker behavior) and provide resources (supplier behavior), using their own terminology. To facilitate awareness and the articulation of work in the formal response community, we present a technology that can bridge the differences in terminology and understanding of the task between the formal and informal response communities. This technology includes our previous work using domain-independent features of conversation to identify indications of coordination within the informal response community. In addition, it includes a domain-dependent analysis of message content (drawing from the ontology of the formal response community and patterns of language usage concerning the transfer of property) to annotate social media messages. The resulting repository of annotated messages is accessible through our social media analysis tool, Twitris. It allows recipients in the formal response community to sort on resource needs and availability along various dimensions including geography and time. Thus, computation indexes the original social media content and enables complex querying to identify contents, players, and locations. 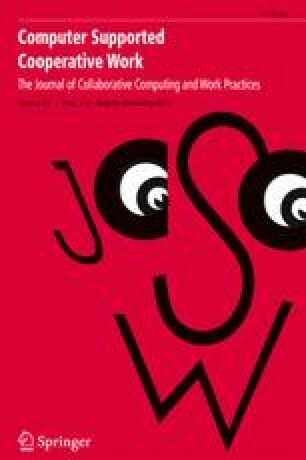 Evaluation of the computed annotations for seeker-supplier behavior with human judgment shows fair to moderate agreement. In addition to the potential benefits to the formal emergency response community regarding awareness of the observations and activities of the informal response community, the analysis serves as a point of reference for evaluating more computationally intensive efforts and characterizing the patterns of language behavior during a crisis. This work is supported by the NSF (IIS-1111182, 09/01/2011 - 08/31/2014) SoCS program. We thank the NSF for their generous support, our colleagues for the valuable comments on the draft and preliminary discussion about designing a coordination analysis framework, James Gruenberg from Wright State’s Calamityville for valuable insight into disaster management, and research assistants, especially Dylan Clericus (undergraduate), Meagan Newman, and Harry Abramovitz. Baer, Drake (2012). As Sandy Became #Sandy, Emergency Services Got Social. Fast Company, November 2012. http://www.fastcompany.com/3002837sandy-became-sandy-emergency-services-got-social. Accessed 19 June 2014. FEMA (2012). Community Emergency Response Team Basic Training Participant Manual. Federal Emergency Management Agency, June 2012. https://www.fema.gov/library/viewRecord.do?id=6137. Accessed 19 June 2014. Fessler, Pam (2013): Thanks, but No Thanks: When Post-disaster Donations Overwhelm. NPR, January 2013. http://www.npr.org/2013/01/09/168946170/thanks-but-no-thanks-when-post-disaster-donations-overwhelm. Accessed 19 June 2014. Imran, Muhammad, Ioanna Lykourentzou, and Carlos Castillo (2013). Engineering Crowdsourced Stream Processing Systems. arXiv preprint arXiv:1310.5463. http://www.aphis.usda.gov/emergency_response/downloads/hazard/Incident%20Management%20Handbook6-09.pdf. Accessed 19 June 2014. Keßler, Carsten, C. J. Hendrix, and Minu Limbu (2013). Humanitarian eXchange Language (HXL) Situation and Response Standard. Humanitarian Response, January 2013. http://hxl.humanitarianresponse.info/ns/index.html. Accessed 19 June 2014. Limbu, Minu (2012): Management Of A Crisis (MOAC) Vocabulary Specification. ObservedChange, January 2012. http://observedchange.com/moac/ns/. Accessed 19 June 2014. Marz, Nathan (2011): Twitter’s Storm: Distributed Real-Time Computation System. The Apache Software Foundation, 2011. http://storm.incubator.apache.org/documentation/Home.html. Accessed 19 June 2014. Myers, Lisa (2005): What Went Wrong in Katrina’s Wake?. NBC News Investigates, September 2005. http://www.nbcnews.com/id/9231926/ns/nbc_nightly_news_with_brian_williams-nbc_news_investigates/t/what-went-wrong-katrinas-wake/. Accessed 19 June 2014. Protégé (2013): Protégé: Ontology Editor and Knowledge-Base Framework. Stanford Center for Biomedical Informatics Research, Stanford University. http://protege.stanford.edu/. Accessed 30 March 2013. RDF Core Working Group (2004). Resource Description Framework (RDF) for Data Inter-Change on the Web. W3C, 25 February 2004. http://www.w3.org/RDF/. Accessed 24 June 2014. Tsukayama, Hayley (2014): Twitter Turns 7: Users Send over 400 Million Tweets Per Day. The Washington Post, 21 March 2013. http://articles.washingtonpost.com/2013-03-21/business/37889387_1_tweets-jack-dorsey-twitter. Accessed 19 June 2014. Twitter Developer (2013): REST API Rate Limiting in v1.1. Twitter, 15 March 2013. https://dev.twitter.com/docs/rate-limiting/1.1. Accessed 24 June 2013. Verity, Andrej (ed.) (2011): OCHA: Lessons Learned Report on the Collaboration with Volunteer and Technical Community in Libya and Japan. Digital Humanitarian Network, November 2011. http://digitalhumanitarians.com/sites/default/files/resource-field_media/OCHALessonsLearnedCollaborationwithVTCsinLibyaandJapanFinalNov2011.pdf. Accessed 23 June 2014.